All good things, unfortunately, must come to an end, and effective March 6, 2019, TransWorld SNOWboarding has closed; the 32nd volume of magazines will be our last, and Kamikazu will be our final film. Over the coming weeks on our site and social channels we’ll publish tributes and reflections from the photographers, editors, filmers, and riders who defined the title over the years, so please check back regularly. 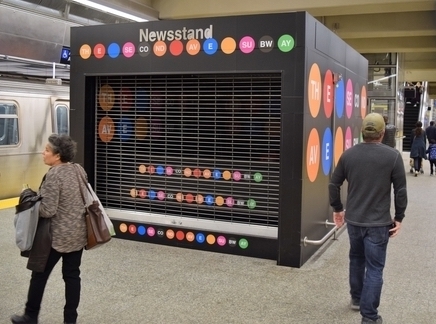 According to a Keith Kelly story in the NY Post, what is left of TWSnow will be “rolled into in-house rival Snowboarder” and go digital. So what’s left? 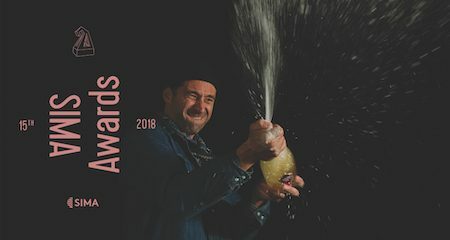 Only three titles — Bike, Surfer, and Powder — will survive with regularly scheduled print editions after 14 titles of The Enthusiast Network were quietly sold to American Media Inc. . . “We always viewed the Adventure Sports Network as an acquisition focused on significant digital scale and unparalleled experiential events,” said an AMI spokesman. It’s good to see that at least an unnamed AMI spokesman has a plan for the recently purchased titles. We can’t wait to see how this all pans out. 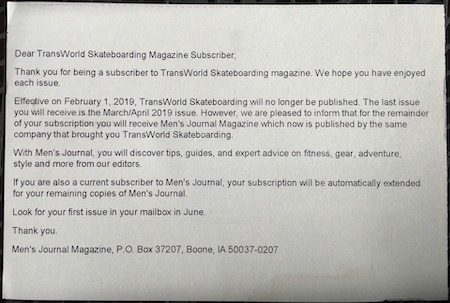 In letters to subscribers that began arriving in mailboxes the week of March 3, 2019, American Media Inc, the current owner of TransWorld Skateboarding and Snowboarding magazines announced that both publications will “no longer be published.” Adding insult to insanity, the company also promised to fulfill remaining subscriptions to the legacy titles with copies of their recently acquired (June 2017) magazine Men’s Journal. Founded in 1983 by Tracker Trucks owner Larry Balma and Peggy Cozens, Transworld Media built a place where creative kids could flourish mostly undisturbed by outside forces. Aside from helping to usher in the modern board sports era and making skateboarding and snowboarding central to mass youth culture, TransWorld also served as a launch pad for innumerable success stories in fashion, design, photography, music, and filmmaking. Simply put Transworld’s contributions to pop culture cannot be overstated. As expected the news lit up social media with eulogies, remembrances, and words of thanks for the part both magazines played in lives of millions. Athletes, artists, magazine editors, photographers, designers, legends, TV personalities, brand owners, and even sports agents praised the magazines and lamented the end of what was a really good run. And that is true. 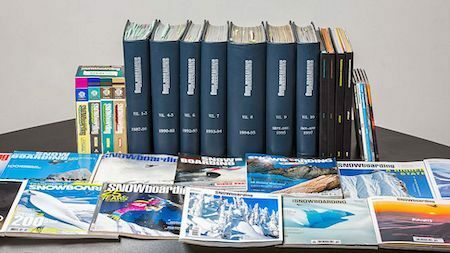 Independent action media brands like Thrasher Magazine and The Snowboarder’s Journal continue to thrive in print, suggesting that the end of print at TransWorld may have more to do with corporate greed/overhead than anything else. Then again, we have yet to see anyone under the age of 30 lamenting the news, so there’s that as well. As for the future, TransWorld Skateboarding will live on as a digital property (the staff has already begun posting “thanks, but we’re still here” to their social media streams) and sources tells us that management is working out the details on how and/or which of the company’s two snowboard brands will be preserved online rolling forward. We’d be more optimistic about Transworld’s digital future if it weren’t for AMI. Their reputation for always doing the wrong thing (along with their reportedly toxic CEO David Pecker) doesn’t bode well for the brands. Through all the sadness we are cheered by the fact that these magazines lasted 20 years longer than we thought they would when we first began preaching the digital revolution. Good work. And, as this has all happened before (remember Skateboarder Magazine and Action Now?) we’re looking forward to what the next generation of creative kids will assemble out of the wreckage. It’s barely March and already the resort industrial complex is inundating us with marketing for their super-mega season passes for the winter of 2019-2020. Really? Already? Why are they doing this and what does it mean all mean? We’re glad you asked. Before we dive in let’s make one thing clear — obviously if you ride 20 days a year or more at the same few resorts owned by the same corporation then buying a super-mega pass is a no-brainer. Spend the $950 and get on it. 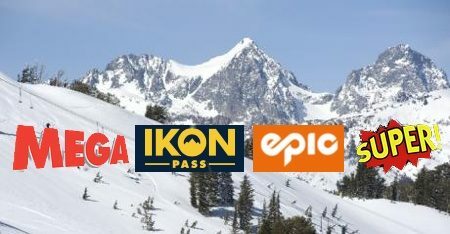 If, however, you enjoy controlling your own money, waiting for good snow, and riding different resorts all season long, here are a few things you might want to consider before shelling out hard earned cash on an Epic or Ikon pass. They want your money now. Not next year. Now! They want ALL your money. Resorts don’t want you to spend a dime with their competitors (or competitor as the case may be in North America). They want to offload all their weather related business risks to you so they won’t have to worry as much when a bad snow year strikes. Once you understand this, the whole mega-pass gambit makes more sense — for the resorts. Look at the way they promote their mega-pass sales. It’s like they’re setting up a con. First, they manufacture scarcity to increase perceived value: “This special deal is available for a limited time only.” We’ve all see the emails, “You have one more week to lock in savings.” “Hurry, this deal won’t last forever.” Why won’t it last? Good question. It could last all season. There’s nothing stopping the resorts from selling super-mega passes all season long. It wouldn’t even be that bad a deal for them. People who bought passes later in the year would have fewer chances to use them. You’d think resorts would do that. But selling passes later in the season doesn’t get your money a year in advance and lock you into their resort for the entire season, and it certainly doesn’t protect resort owners from the specter of a bad snow year. Lately, we’ve been wondering what it’s been like for that small group of action sports media professionals who survived the AMI takeover of The Enthusiast Network. How is working for Trump pal David Pecker? So far we’ve heard nothing from inside the building, but The Daily Beast posted a profile on March 2, 2019 titled How David Pecker Built His Tabloid Empire on Fear that might give some insight into how it could be going for those who still remain. The old story, written nearly two decades ago, suggests that Mr. Pecker has morphed his management style very little over the past 20 years.